Those of you who follow me on Twitter will know that I've been a bit bah-humbuggy in the run up to this Christmas. I'm not sure why. Maybe it's because I went back to work from maternity leave in March and so my body clock is screwed and I'm just not ready for Christmas - come March I'll probably come over all festive and be wanting another turkey dinner. Add to that the fact that this is the first time I've hosted Christmas at my house and it's just been a whole other level of stress. I love my mum, really I do. But she likes to help in the kitchen and I don't like being helped by anyone unless they do-as-I-say. This is rare as nobody listens to me. Not the husband, or the child, or the dogs, or most other people. It drives me potty when something is simmering and the husband appears and tells me that he's been stirring it 'because it was burning'. My kitchen is quite small and so there's not really room for anyone else when you're trying to cook dinner for two, let alone six. I also think Mum is feeling at a bit of a loose end as she's not got the turkey dinner ahead. She's in charge of entertaining the child and keeping her out from under my feet (which in turn will hopefully keep mother out of the kitchen unless I have a crisis). Of course I want to show off a little bit too and do things a bit differently rather than just plain roasties and plain carrots and plain sprouts. The husband doesn't often pay compliments - especially about my cooking - but he always says he prefers my turkey to my mother's. Result. But of course, we have all the foibles still to deal with. My Grandad doesn't like almonds, icing and marzipan or Christmas pudding so I've had to make special mince pies with a regular top for him (everyone else is getting the Thomasina Miers mince pies I tried a while back). The husband will only eat Bisto instant gravy so I've had to borrow two gravy boats from my mum because everyone else is getting home made gravy whether they like it or not (but I got mum to bring Bisto as a back up just in case). Last year I made these amazing roast potatoes. Radical. Cooking the potatoes in fat and with the sausages and some garlic. The hubby said they were the "best roast potatoes ever" and now I'm never allowed to cook them another way again. So for this year's recipe I wanted to do something with the sprouts. Pancetta and chestnuts seem to be the default recipe and I've been intending to road-test this for some weeks, but here we are at Christmas day and I'm just having to go with the flow. What stopped me in my tracks was that I didn't realise everyone uses pre-cooked tinned chestnuts. I rather blindly assumed I'd need real ones so there's a bagful sat in my fruit bowl looking a little folorn as I didn't know how to roast them and now I know, I can't be bothered. Instead I made these. Simplicity in itself. Cooked in advance just in case they tasted horrible and will reheat later. 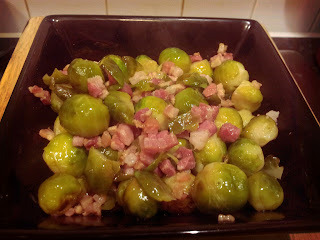 Word of advice - go careful on the stock as the pancetta makes the overall taste quite salty but it works well with the blandness of the sprouts (I have yet another cold so can't taste subtle flavours). Wish I'd thought to roast the chestnuts yesterday to go with the mulled cider. Far too much food around the house today for any more to be added to the mix, but will maybe give that ago tomorrow. Fry the pancetta in a large non-stick frying pan for 4-5 mins until crispy and golden, then add the Brussels sprouts and cook for a further min. Pour in the chicken stock and simmer for 15-20 mins until the sprouts are tender and the stock has reduced. Melt in the butter, season well and serve.